Singing, when done right, should feel good. I am a singer. I have studied singing for over 20 years and have been teaching voice for the past 12. I have a degree in Vocal Performance from WWU. I was in the popular band Late Tuesday for 7 years and have continuously been a part of various other bands since then. 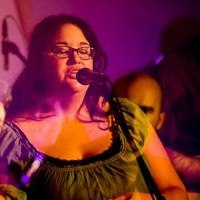 I have 17 years experience with leading religious worship and have coached worship-leaders on vocal technique and song leading. I also teach very-basic piano and guitar and have coached songwriters in their craft. I approach singing holistically: you can’t separate who you are from how you sound. Your instrument is YOU, therefore my students often experience breakthroughs in singing and compare them to good counseling sessions. This should by no means suggest that I will be sitting across from you asking you about your feelings all the time. It does mean, however, that by choosing to work on your voice, you are choosing to work on your self. I also want to teach you how to enjoy singing and sing without injuring your voice. Singing when done right should NOT hurt. You might be an 8th grader whose goal is “to sing and play Adele songs”, a rock musician who wants to protect and hone their voice instead of thrashing it every time they play a show, or an adult who has been told all their life that they could not carry a tune and just wants to sing on-key. Helping you find your voice is a passion of mine. In each lesson we work on proper breathing and vocal range with warm-ups, then practice songs. Song selection can be up to the student or teacher, depending on your goals. I find that students who have specific goals or songs THEY want to sing tend to practice better, therefore advancing faster and enjoying the process more. “I love Tara’s holistic approach. She wants you to GET IT. Tara tailors her lessons to your needs and goals, whether you’re just starting out, or you’re an active singer looking to add depth and technique to your bench, or anything in between. I teach from my home studio in North Seattle. I work with a wide variety of clients, ages 9 and older. One-hour sessions lend themselves to faster progress, but half-hour sessions are available as well. Because musical training requires practice and persistence, students are required to make a six-month commitment of one lesson a week. (I take two weeks off during each six-month period.) Billing is on a monthly basis, paid online or by check, due by the first of the month.